This organ was unused for a long time ago. The wire was broken and always forgot to buy new wire. I thought this organ would only be a display in the house because of being idled. Well, for a year or I think more than I got the chanced to buy the thing needed for this organ to work again. Actually, this can be used not only in connecting through outlet but with batteries as well. Sadly, the batteries needed are the big one and not only one or two but six. The price of one battery gives headache to me and based on my computation I will pay more, than getting new wire. To make the story short, I went to the music store and asked for the wire, they have one but the price is high. I went to Ace Hardware and fortunate to get one at lower price. My daughter was very happy when she heard her organ playing again. 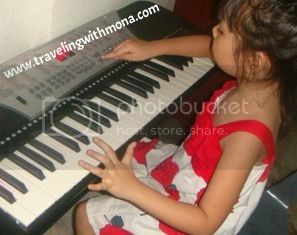 This is not yamaha digital piano but the happiness i saw in my daughter is just liked playing a Yamaha piano, wink! I wish to send her in a music school because i’m seeing her fond of playing instruments and singing but my financial status won’t support her passion at this time but hoping soon, need to wok hard.